From Carnival Attraction to 32' Tiny House? 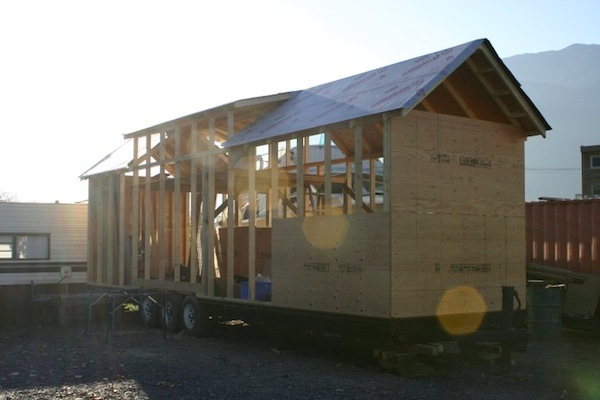 From Carnival Attraction to 32′ Tiny House? A few days ago I received a Facebook message from Denham and Eileen who are building their own tiny home in Canada. When it comes to living and building tiny, you can get as creative as you can imagine. And that’s one of the things I love about it so much. Another thing that makes this house different is that it’s 32 feet long so it’s a bit longer than most tiny homes out there. It has three axles instead of just one or two and there’s a potential of at least 272 square feet or more of space if there are usable lofts once it’s finished. I’ve always loved the idea of couples and tiny houses because of the opportunities tiny living offers people in life. So I just think it’s nice to see a tiny house being built with more than enough room for two simple peeps. I thought you might enjoy this project too since they’re doing all the work themselves, getting it done for cheap and they’re using reclaimed materials (like the trailer). How do you make the work go by fast while enjoying it? and have fun and take your time while you work! You can find out more about Denham and Eileen’s tiny house construction project over at their blog. If you want to know how all of this trailer construction stuff works I highly recommend Dan Louche’s step by step construction guide on tiny houses. And if you liked this “carnival attraction to tiny house” post you’ll love our free daily tiny house newsletter! Tried building a Tiny Home with steel studs or sip panels.seens to me their light weight would help with pulling the trailer.also the sip panel would speed building time. SIP panels are great I agree and they would save some time but some people enjoy framing. I think I’d enjoy framing my self. Yes people have used steel studs before (TinyGreenCabins.com) it’s just that it’s not the most common because wood is easier and more fun to work with. We considered structurally insulated panels, however the traditional way is quite a bit cheaper. The trailer is rated at 15,000lb so hopefully we don’t go over!